In my recent paper for the Center for Freedom and Prosperity, I explained how the U.S. economy is at risk of a Greek-style fiscal crisis. It is very important that our elected officials understand the seriousness of this situation. Once we go over the edge, there is no coming back: as I explain in my book Industrial Poverty, after Sweden plunged into a fiscal crisis in the early 1990s, the country never returned to its heights of prosperity as before the crisis. Likewise, after the fiscal crisis during the Great Recession Greece has plummeted into a permanent state of industrial poverty. the Medicare IPAB has been terminated - it was never active but it did serve some purpose as an institutional nod to spending restraint. Now Senator Rubio (RINO-FL) has presented a proposal for a new paid-leave spending program that can fast-track Social Security to bankruptcy and, when fully developed, will blow up the entire federal budget from the inside. He has growing support among GOP senators, and will probably win widespread backing in the House as well. This welfare-statist attitude toward the role of government in people's lives spans decades of combined efforts by Republicans and Democrats. There are frightening parallels between where we are today and where Greece found itself shortly before their fiscal crisis; there are also differences, but the similarities are gradually outgrowing the differences. Therefore, the consequences of the Greek crisis should serve as yet another warning sign that it is time to act now - or we will pay a very heavy price as a country, economically, socially, politically and culturally. -In the first quarter of 2012 the same rate was 24.7 percent. The cost of borrowing money for the Greek government on a ten-year basis rose by 563 percent. 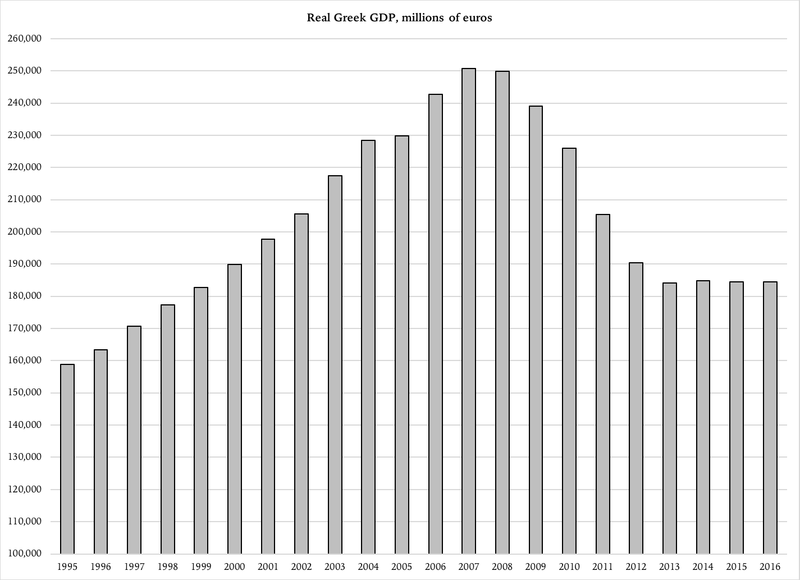 Since not all government debt is sold through one product, such as the ten-year bond, this is not a straightforward image of the actual increase in debt financing costs that the Greek government faced at the time. That said, interest rates on different bonds with different maturity have to move in parity, or else there will be imbalances between risk and risk premium that the market will be quick to exploit. Therefore, the 563-percent rise in borrowing cost through the ten-year bond is a reliable indicator of the trend in the Greek government's debt burden. For comparison, a five-fold increase in the interest on the U.S. government debt would grow the cost from $504 billion (estimated in 2018) to $2.5 trillion. This is more than the cost of Social Security, Medicare, Department of Defense, Department of Transportation and the Department of Education combined. In order not to crowd out any other spending, this kind of increase in the cost of maintaining the federal government's debt would require two trillion dollars in higher taxes. A doubling of all income taxes would only yield 80 cents of every dollar needed - and that is before we take into account the crippling dynamic effects of such devastating tax hikes. Either that, or the Federal Reserve would have to start printing money like - literally - there is no tomorrow. During the height of its Quantitative Easing, the Fed printed almost $1 trillion per year; to neutralize a quintupling of the interest on the U.S. debt, it would have to pump out new money at twice that rate. Although there is no straightforward relationship between money supply and inflation, there is a breaking point beyond which reckless money printing brings a currency to collapse. It is difficult to predict this point a priori, but it is a safe bet that if the Federal Reserve started cranking out $2 trillion per year just to buy Treasury bonds, the U.S. dollar would very soon be in grave danger. It is unlikely that the Fed leadership would let that happen, which leaves the response to an interest rate shock in the hands of the Treasury - and ultimately the president and our loitering Congress. Reasonably, the United States would not suffer an interest rate shock of the kind that Greece did. Their experience was a creeping one, unfolding over four years. However, it is interesting to note that the bulk of the rate hike, from 6.2 percent to 24.7 percent, took place in the first two years of austerity policies. Despite the European Central Bank's increasingly accommodating monetary policy, debt-market investors kept raising doubts about the Greek government's ability to honor its obligations. As a result of the strongly negative growth rates, tax revenue plummeted and caused the budget deficit to increase again. For comparison, a decline in the U.S. economy of 20 percent in real terms - 25 percent in current prices - would wipe out the last 14 years' worth of growth. Bluntly speaking, we would all be living on the actual incomes earned in 2004 while paying the cost of living of 2018. 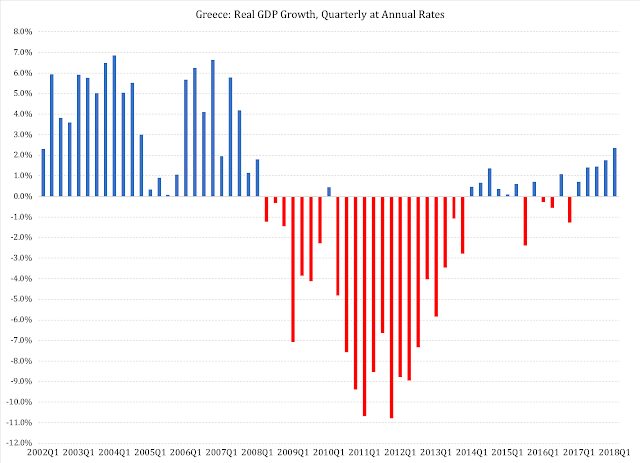 However, that is only the beginning: during the years when one quarter of the Greek economy vanished, taxes increased exorbitantly, from 39 percent of GDP to 50 percent of GDP. Translated to an American context, this means that a similar economic disaster here would not only send your earnings back to 2004 without doing the same to the cost of living, but your taxes would also have to go up by one fifth. In other words: your taxes would be 20 percent higher, while your pre-tax income would be 25 percent smaller. Perhaps the worst part of this is that the entire crisis could have been avoided, had the Greek government decided to abandon its ideological commitment to the welfare state. The Greek disaster was brought about because its government did everything under the sun to avoid having to structurally reduce its welfare-state spending. Before the crisis, they maintained spending above what taxpayers could afford; in the 25 years before the fiscal disaster, tax revenue grew by seven percent per year. There was no shortage of money in the Greek government's coffers - just as there is no shortage of tax revenue in the U.S. Department of Treasury's bank accounts. During the crisis, the Greeks decided to defend the welfare state at all cost. They imposed devastating tax increases, cutting spending only when they had taken those tax hikes to the point where the country was about to fall into chaos and anarchy. When they cut spending, they only did it in a way that would preserve the spending programs per se - they kept their spending promises in place so that it would look like the welfare state was still operating, then reduced the amount of money they put into the programs. By institutionally preserving the welfare state, the Greek government prevented privatization that would have opened up for productive tax cuts. Instead, by maintaining the institutional structure of their welfare state, they kept people in dependency on a government that could no longer afford to honor its promises. This choice is a safe recipe for keeping Greece in its current status as a nation in industrial poverty and the shadows of its prosperity of the past. We are heading down the same path. We can still avoid the disaster, but time is running out.